The amazing Glutathione is the body’s most powerful healing agent, protector from pathogens and toxins and the most important master antioxidant. 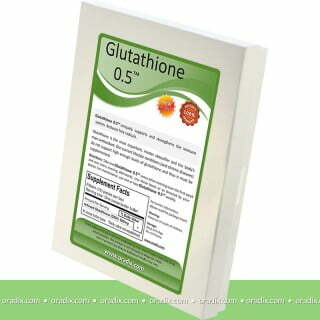 The highest level of Glutathione is needed overnight for cellular detoxification and rebuilding. Oradix has the ONLY professional strength Glutathione options (Glutathione 1,500mg or 500mg) that keeps the levels high overnight due to slow rectal absorption. Liposomal, sublingual or IV Glutathione are used over the day when actually the need is much lower. – by Jean Carper: Stop Aging Now! Elevated Glutathione is more important as we age than long telomeres or high levels of circulating stem cells. Scientific studies indicate that glutathione levels play an important role in aging and longevity, exercise, stress, physical and emotional trauma, balding and hair loss, psoriasis, dermatitis, seizures, sleep, Down syndrome, Huntington’s disease, burns (radiation, sunburn and UV), cancer, rheumatoid arthritis, Parkinson’s disease(! ), Alzheimer’s disease, arteriosclerosis, heart disease, stroke, cholesterol and plaque formation, diabetes, viral infections(! ), hepatitis, AIDS, multiple sclerosis, asthma, bronchitis, emphysema, COPD (chronic obstructive pulmonary disease), smoking, pulmonary fibrosis, cystic fibrosis, gastritis, stomach ulcers, pancreatitis, ulcerative colitis, Chron’s disease, dialysis, renal failure, cataracts, macular degeneration, glaucoma, sinusitis, ear infection, noise exposure, hearing loss and deafness, infertility and fertility, prostate problems (enlargement, cancer and sperm functions), (pre)eclampsia, hypertension in pregnancy, diabetes in pregnancy, fetal development and breastfeeding1. Glutathione levels predict survival2. This entry was posted in Health News and tagged antioxidant, detoxification, glutathione, stem cell, suppository.